Pacman type game for Windows 3.0 Protected mode. Copyright (C) 1991 Neolithic Software, Inc. Welcome to Chomp for Windows. 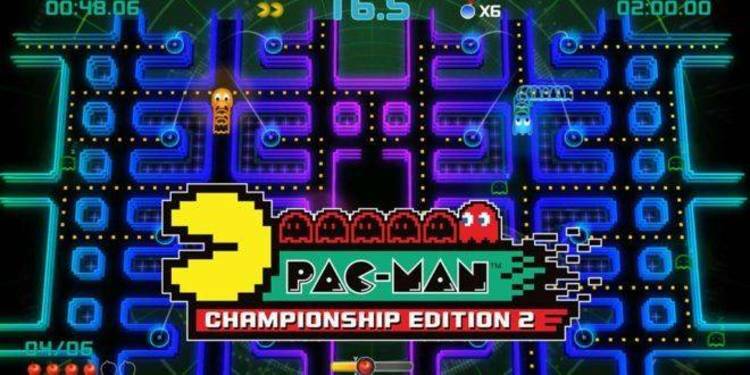 This is a game closely patterned after Pac-Man(tm) for the Microsoft Windows environment. I have tried to make the game as faithful as possible to the original. However, since I haven't seen a Pac-Man arcade machine for years, all of the elements of the game have been recalled from memory. Chomp for Windows is an enhanced port of Xchomp, a similar game that runs under the X Window System on UNIX workstations. The enhancements include a full color display and an adjustable game speed. Unlike the original Pac-Man, Chomp has several different mazes, but it does not have side tunnels. The latter feature is planned for a future version of the software. The purpose of the game, as in all arcade-style games, is to amass the highest possible score. However, you may find that the fun in the game is in reaching the highest possible level; at least, that is what I found fun about the original. You, the player, are the circular yellow mouth moving around the maze. Initially, this maze is filled with white dots. To complete a level, you must eat all the dots. To eat a dot, you simply pass over it, collecting 10 points. There are also four ghosts chasing you around the maze. Allowing a ghost to catch you costs you a life. Each maze also contains several large flashing dots -- the power dots. Eating one of these gives you 50 points and temporarily gives you the power to eat the ghosts. While the ghosts are edible, they are blue, they move at half-speed, and they try to run away from you. Eating a ghost adds points to your score; the number of points added is briefly displayed on the screen. Once a ghost has been eaten, it turns into a harmless pair of eyes moving at double-speed, seeking return to the ghost box in the center of the maze. When it gets there, it is "reborn" and resumes chasing you around. The ghosts only stay edible for a short period of time. They will not change back suddenly, however; they will flash for a couple of seconds to warn you before they do. While they are flashing, you can still eat them. Each level in the game is indicated by a symbol. For example, the first few levels are "fruit" levels, that is, they are indicated by small fruit icons at the bottom of the Chomp window. Once in a while, the symbol corresponding to the current level appears in the maze. Eating the symbol adds points to your score, and the number of points added is displayed on the screen. On some of the higher levels of the game, this is a very substantial number. Once a symbol appears, you only have several seconds to get to it. You start the game with three lives. Reaching a score of 10,000 points awards you an extra life. This is strictly a keyboard-controlled game. The original game had very simple controls -- one four-directional joystick. All control in Chomp for Windows is done using the arrow keys. Pressing an arrow key is equivalent to tilting a joystick in the corresponding direction and holding it down; the player on the screen continues moving in its current direction until motion in the specified direction is possible, or until it hits a maze wall, in which case it stops. Only one keystroke is remembered; the last key pressed indicates the desired direction of motion. If this sounds complex, forget it, and just play the game. I believe that once you get used to the game control, you will find it fairly natural. One hint that I can give you is that you will need to be thinking ahead a little bit at all times. For example, if you want the player to take the next left turn, press the left arrow key immediately -- the keystroke will be remembered; if you wait too long, the player may move past the turn you meant to take, and you will need to turn around. Do not hold down any arrow key; just tap it, and be careful not to press two keys at a time. I suggest playing a game or two at a slow speed to get used to the controls. You can pause the game by pressing the space bar at any time. While in Pause Mode, you can press F2 to abort the game and return to the title screen, or F3 to exit Chomp for Windows. The game will also enter Pause Mode if you minimize the Chomp window. The Chomp for Windows program must be run in protected mode; it will not run in Windows' Real Mode, nor will it allow multiple instances of itself to be loaded. Invoking a second Chomp for Windows instance will simply restore and give keyboard focus to the window belonging to the instance already in memory. This program attempts smooth animation in the Microsoft Windows environment, and therefore it requires a fairly powerful PC. Although it is a true "well-behaved" Windows application, the program should obviously be run with all other loaded programs minimized or "asleep" -- waiting for input from the user. Make sure you move the mouse cursor well out of the Chomp window in order to prevent it from flashing during gameplay. The minimum recommended hardware platform for Chomp for Windows is a 16MHz 286 or 386SX machine with a decent color video configuration. The Chomp for Windows program needs a bit of time to initialize when it loads. This may be in the range of 10 or 15 seconds on slower machines. If you find that the game runs too quickly or too slowly, try adjusting the Animation Delay value in the Settings dialog box, accessed from the system menu of the Chomp window. On a 16MHz machine, this value should be set to zero, resulting in the fastest motion possible, which should be just acceptable on such a machine. The delay value is calibrated so that a setting of 150 works well in a 33MHz 386 system with fast VGA video. Values up to 999 may be entered. Chomp for Windows is not public-domain software. It is shareware. I retain the copyright on all versions of Chomp for Windows. You may distribute Version W1.1 as long as you include this document and distribute the software unmodified, free of charge, and without additional restrictions. There are no explicit or implied warranties; use the software at your own risk. The registration fee for Chomp for Windows is $20 with a free 7-day trial period. If you intend to use Chomp for Windows beyond the trial period and would like free updates and discounts on future Neolithic Software products, please register. The source code for Chomp for Windows is available, along with the registration, for $45.